Photo courtesy of Kimmel Kids. 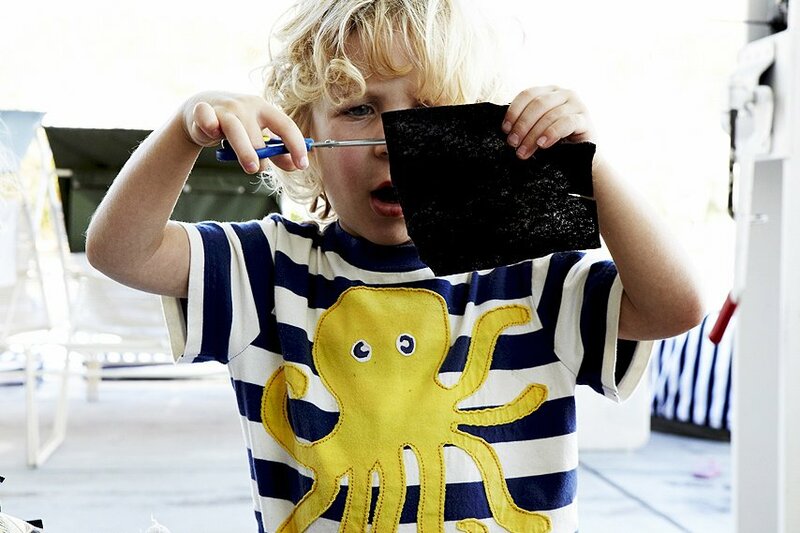 Perfect weather and next-level arts and crafts draw creative parents with budding tots to the California desert for a weekend of quirky family activities organized by Crafting Community. Writer Christine Lennon recounts the highlights of her highly successful family vacation. PALM SPRINGS – Wonky potholders. Crunchy potpourri sachets. God's Eyes strung with green, acrylic yarn. If the word "craft" still makes you cringe with memories of bad embossed leather bracelets, allow me to introduce you to L.A.-based installation artist Karen Kimmel. Once a year, Kimmel packs up her phenomenal ideas and equally talented friends and heads to the Ace Hotel in Palm Springs for a Crafting Community weekend. Roughly 60 families descend on the property — a former HoJo's that's been revamped to rustic vintage/mod perfection by Commune design collective, another L.A.-powerhouse — to felt rocks and string beads. Tait Chatmon and Stacy Bernstein of Kid Concierge organize activities like morning yoga, campfire storytelling, and family movie night. Kimmel's aesthetic is modern and vibrant, a distinct mix of neon accents and botanical-inspired forms, and her enthusiasm is infectious. When I first wrangled my three-year-old twins into the car for the two-hour drive east, dangling the bait of making cookie masks when we arrived, I expected the crafts to hold their attention for five minutes max. Instead, the duo created spin art on vintage vinyl, felted tiny rocks, painted T-shirts, and pinballed between activities, all while screaming (with joy, I think). Thanks to the many artists and artisans who set up tables and stations at the Ace's community center, my kids fell in love with the process of making things. Actually, they called it the Making Things Party and (miraculously) still remember nearly every detail of the event two years later. There's something about the desert that I find completely inspiring, however cliché it feels to type those words. Watching my kids stretch their imaginations under that big, bright sun made me impossibly happy. We sat with other little guys and their parents to create succulent gardens in mason jars and strung together paper clip necklaces wrapped in a rainbow of masking tape. The comfy cotton masters at Splendid, whose SoCal store openings Kimmel hosted, donated scraps of brightly colored fabric for braiding and beading into neo-macrame style necklaces. Fashionistas ranging in age from 3 to 60 admired each other's handiwork. They also let everybody choose from a spread of prints and patterns to create a custom infinity scarf (known to my daughter as the Making Things Scarf, which is still a favorite accessory for chilly days at preschool). After the first fire-roasted s'more of their young lives, also a big impression-maker, we piled into bed and dreamed of pom-poms and popsicle sticks through the cool desert night. Beyond the expertly organized crafts and the inspiring "how'd they think of that?" ideas, there's the perfect late-spring weather, the family-style taco night, stories by the fire, parent/child yoga in the morning, and, more than anything, really, a community cemented by a ton of glue and a love of making things with their kids. This year, thanks to some much-improved swimming skills, we may be brave enough to join the underwater photography seminar. It's like the coolest camp in the world where the parents get to hang out, too, but with infinitely better (mostly organic, sustainable, local) food. And there's not a single lopsided ashtray in sight. If it weren't for the fabric markers in every imaginable color, I'd call it good clean fun. Crafting Community will be held this year on May 1-3, 2015, at the Ace Hotel in Palm Springs. You can get tickets through Eventbrite. In addition to crafts, additional workshops and activities include underwater photography, tie-dye, spin art, SoulCycle classes, obstacle courses, bingo night, ice cream social with Jeni's, and desert disco. Christine is a freelance magazine writer living in Los Angeles. You can follow her on Instagram. She travels for the change of pace.